In episode I-IV of Umineko no Naku Koro ni, “blunder”, everyone had come to see the room where Eva and Hideyoshi were killed. George grieves over the death of his parents, swearing that he would kill whoever was responsible. Not only did he lose the woman he loved the previous day, but now he has lost his parents as well, joining the other grandchildren of Kinzou who have lost their parents. At least Maria does not quip about Beatrice, nor does she smile about it. Natsuhi notices the letter on the ground and picks it up. The time is just before 7:30PM. The door to the room of Eva and Hideyoshi is locked so that the crime scene can be preserved until the police arrive. Maria then notices an odd and unpleasant smell, which is soon noticed by everyone else as well. Kanon and Chiyo are sent to investigate the smell. While George is wallowing in his grief, Battler and Jessica talk about the locked room murder of Eva and Hideyoshi. Jessica speculates that the killer impaled Eva in the head when she opened the door, but while this would explain the door chain still being set, it would not explain her body ending up on the bed, much less Hideyoshi’s body in the bathroom. This is when Maria drops in the conversation and tries to convince Battler that it was all Beatrice’s doing. Battler finally has had enough of Maria being too much into the witch thing and whacks her on the head. Changing the topic, he asks her about the bloody drawing on the door to Eva’s and Hideyoshi’s room, and she says that it is the First Magic Seal of the Moon. It refers to Psalm 107:16 of the Old Testament, and supposedly it can open any sealed door, no matter how it is sealed. Given the topic, Maria can’t help but start laughing creepily again, but Battler isn’t having any of it anymore. As Battler and Maria bicker in the background, Jessica quietly talks to George how weird Maria is acting even for a witch fangirl, not even reacting much to the death of her own mother. George then asks Jessica if she suspects Maria is involved in the murders. Jessica points out that Maria is the only one who had supposedly met Beatrice, and wonders if Maria knows who the supposed Beatrice really is but is hiding the identity. Kanon and Chiyo head downstairs to check out the boiler room where the smell seems to be originating from. But a sudden sound frightens Chiyo, so Kanon enters the boiler room alone before whoever it is can run away through another exit in the room. The lights won’t switch on, but at least Kanon picks up a weapon to defend himself. Incidentally, the weapon is a type that would be favored by a certain girl in Hinamizawa. Kanon seems to start talking to Beatrice, as we see golden butterflies appear in the room. Using an analogy with roulette, Kanon talks about how low risk bets have only low potential payoffs while high risk bets can have high potential payoffs. Kanon mentions that Kinzou called the fulfillment of an astronomically low probability event a miracle, and also called the payoff from such an unlikely event magic. 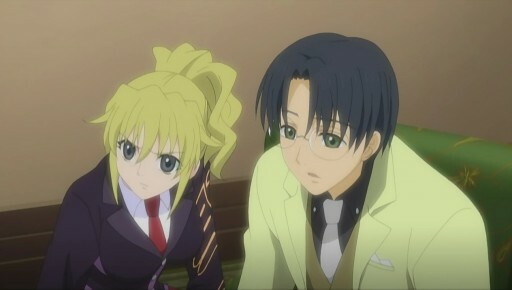 Kanon does not know what sort of magic Kinzou and Beatrice aimed for, but he tries to remind Beatrice that there are not just red and black pockets in roulette, which presumably represent the plans or wishes of Beatrice and Kinzou, but also zero, the pocket that is green. He is basically expressing his intentions to do something entirely out of the norm. 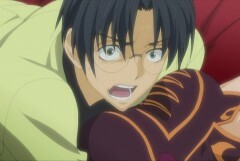 Kanon had previously decided that in case Shannon died and he survived, he would do everything in his power to derail Beatrice’s game and return it to nothing. He declares that he is no longer a shadow and is now a zero in Beatrice’s game of roulette. He intends to stop the evil roulette game, and I think he declares that he won’t let her take something to hell and that she should bring out the next summoner. I think Kanon’s conversation in the boiler room is hugely important to deciphering what is going on. Unfortunately, Kanon hears a sound behind him and turns around, and when he turns back after seeing nothing, he is impaled in the chest, with the golden butterflies having disappeared. Everyone heads down to the boiler room and are shocked to find Kanon stabbed in the chest, who is still alive and even managed to pull out the metal stake. Actually, I think Kanon has just shortened his lifespan by pulling it out, as this would increase the blood loss, although it might actually be the killer who pulled it out to speed up his death. Battler runs through the other exit in the boiler room to the outside where it’s raining, but there is no sign of the killer. While Nanjo tries to save Kanon’s life, the lights have been fixed in the boiler room. It turns out that what appears to be Kinzou had also been stabbed in the head with the same type of weapon that had killed Eva, Hideyoshi, and (almost) Kanon. Additionally, the body was burned within the furnace, which explains where the odd smell came from. 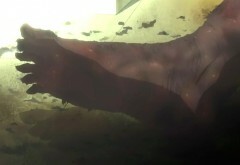 And it is confirmed that it is Kinzou’s body because it also has six toes on a feet just like Kinzou had. It is also noticed that Kinzou is not wearing his ring, which is a definite confirmation for everyone besides Maria and us (who already knew it) that Kinzou was not the source of the letters. Almost everyone is back in the living room, except for Nanjo and Jessica who are caring for Kanon. This is how Battler figures out that Jessica must be in love with Kanon. While the door to the boiler room from the stairs was locked, the other door does not have a lock at all, so at least the attack on Kanon is not another locked room mystery. This has George leaning to the outsider as killer theory, presumably because everyone else were together, except maybe for Chiyo (who may have went to call the others and so may have been with them as well). Battler points out that the killer may still be one of the Ushiromiya, since the killer could have taken advantage of the fact that the original six victims’ faces are nearly unidentifiable and an outsider could actually be one of the dead bodies. Nanjo and Jessica join the others, and with how Jessica is grieving, it is quite obvious that Kanon is no longer among the living. Battler continues on with his thoughts: regardless of whether the killer is an outsider, the killer almost certainly has something like a master key that can open most doors on the island. Genji thinks that the killer could have taken Gouda’s master key, which has Chiyo shuddering in fright that nowhere on the island is safe. This reminds Genji that there is one place that would be safe. This place is Kinzou’s study. Maria agrees with this assessment by pointing out the magic seal on the doorknob, which is the Fifth Magic Seal of Mars, based around a scorpion and serves as a charm against evil magic. It is the same sort that Maria had given to Battler and Jessica the previous day. The time is almost 10:00PM. After the break, the time is now exactly 10:00PM. Everyone takes shelter in Kinzou’s study, and it turns out that the door automatically locks itself. The only keys to the study are carried by Kinzou and Genji, and Genji remembered to retrieve Kinzou’s key from his body. 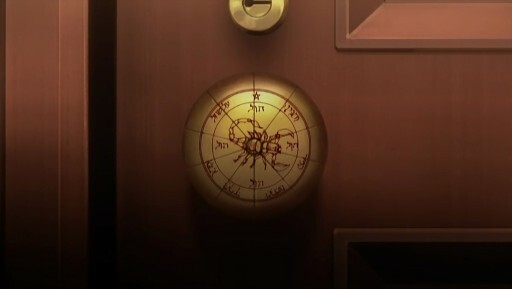 The magic seal on the doorknob outside reminds Natsuhi about the scorpion amulet that Jessica had given her, with Maria pointing out that it must have protected her, of course. This reminds Battler of the letter that Natsuhi picked up at the room of Eva and Hideyoshi, which only says to “give praise to my name”. This is presumably a message from Beatrice, so disregarding the question of whether she is a witch or not, Battler asks Genji to confirm that Beatrice actually exists. After Natsuhi speculates that Beatrice may be Kinzou’s lover, Genji reveals that Beatrice had died a long time ago as far as he knows. While Kinzou had married his late wife for political purposes, his true love was Beatrice. This was why Kinzou had become obsessed with black magic: he wanted to find a way to revive Beatrice. Jessica speculates that Kinzou wanted to believe Beatrice was revived and living with him, and she and George understand what they believe to be their grandfather’s feelings. Kinzou’s love for Beatrice raises another possibility, and Battler asks Genji whether he had heard anything about a child between them. Genji has heard nothing of the sort, but the topic of children reminds Jessica that she had heard about Kinzou heavily supporting a certain institution for children without relatives. 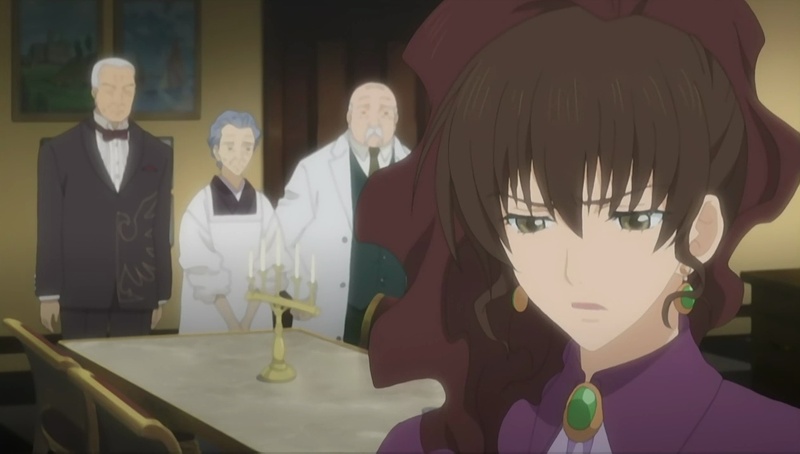 Jessica had also heard rumors of children being taken from the institution to the mansion where Kinzou would use them as experimental subjects or sacrifices for his research into black magic, but Natsuhi does not tolerate such rumors that tarnish Kinzou while she puts a can of mackerel on a table. Mention of sacrifices jogs Battler’s memory and he realizes that the murders seemed to follow the inscription next to the portrait. Luckily for them, they do not have to leave the study as it also has its own portrait of Beatrice and the associated inscription. We knew that the inscription is somehow very important so that we realized the pattern of murders match the inscription. However, it is no surprise that Battler and others did not realize it until now, given how they must have only considered it an unimportant text from an occult mania. The unfulfilled portions of the inscription raises alarms as it says to kill at least three more people and even specifies that no one would be left alive. Maria laughs with a little less creepy expression than normal, declaring that things would be fine because once the village of gold is reached, one of the rewards would be for everyone to revive. At least Battler and Natsuhi are sure that Kinzou isn’t doing the killing even if he had gathered everyone to fulfill the inscription, considering that Kinzou was among those killed. This is when Maria points out a new letter supposedly from Beatrice. This has Natsuhi immediately pointing a gun at the employees and having Battler read the letter. It asks whether they are enjoying the mystery of the inscription, which indicates an uncanny insight into when they would realize the inscription’s relevance, and it says that there is not much time left for them, that waiting for the storm to end and escaping is not an option. It says that either the writer or they must win the game, and it is automatically the writer’s victory when time runs out. Natsuhi’s reaction upon seeing the letter is soon explained, as the letter was not on the table when she put a can of mackerel there earlier. This means that only those who had not gathered around the portrait could have placed the letter on the table, so it must have been either Genji, Chiyo, Nanjo, or Maria. Battler tries to defuse the situation by suggesting that someone had discretely entered the room and left the letter on the table, but his attempt fails miserably as it is way too far-fetched. I’m certain that Maria was not responsible, since we saw the table void of the letter when she was standing right besides Natsuhi and the others. Maria claims that Beatrice is not one of them and actually exists, and Battler asks if Maria had seen Beatrice enter the room. Maria sardonically responds by pointing out that Battler ostensibly does not believe Beatrice exists, but he ends up considering her existence possible only when he does not want to think the killer being among them. Natsuhi wants Genji, Chiyo, Nanjo, and Maria to tell the rest who had left the letter on the table or to leave the room, and none of them can or will say who it was, so they decide to leave the room. Genji leaves behind his master key and both keys to the study. Before leaving, Maria says not to worry, that the door to the village of gold would soon open and everyone would be revived, that everyone would become happy. The way she says it doesn’t make it sound that this would be a good thing, though. 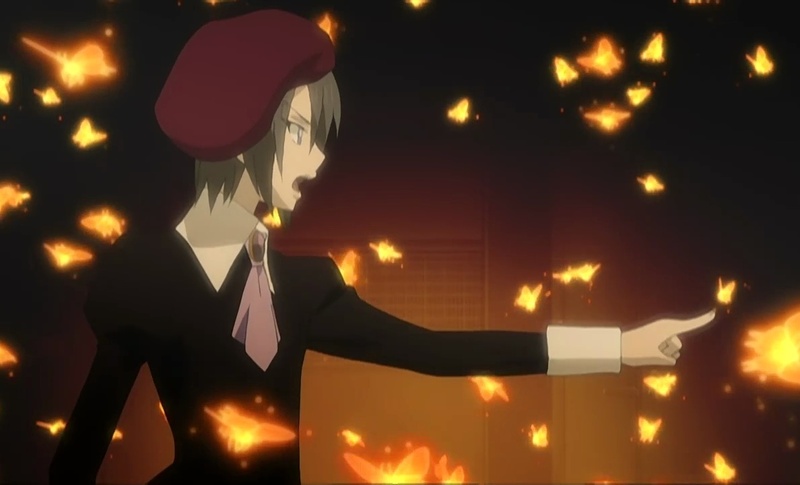 Nanjo tells Battler that it would be better not to provoke the paranoid Natsuhi (which explains why they aren’t making any fuss), and Battler returns the scorpion amulet to Maria before they leave, admitting that he had not lost it in the first place and that he had lied about it the previous day out of stubbornness. Natsuhi may feel some unease since some of those that left might be innocent and would end up in danger, but it doesn’t really concern her since her daughter’s safety is her topmost priority. She thinks it would be over by tomorrow, hoping that the police can capture the killer when they arrive. Battler then notices another page with a magic seal behind the letter. The time is now 11:30PM. After some digging into Kinzou’s repository of books on black magic, Battler has discovered that the magic seal is the Third Magic Seal of Mars. It refers to Psalm 77:13 of the Old Testament, and it supposedly causes internal strife and division of an enemy. This is just what happened because of the letter. The phone rings right at this moment. Everyone is wary, because the phone lines had gone dead the previous day. Natsuhi speculates that Genji had managed to fix the phone lines, but when she picks up the phone, all she hears is an unresponsive young girl singing. Natsuhi, Battler, George, and Jessica hurry downstairs and opens a locked door with the master key. When they enter, they find all the adults dead. Genji has been impaled in the stomach, Nanjo and Chiyo have been impaled in a knee, and all of them had their faces destroyed. And Maria is facing the wall singing to herself next to the dangling phone. The boat should arrive at Rokkenjima the next day, which could then contact the police by radio. However, it most probably will not arrive soon enough as the letter said. The fifth to seventh twilights in the inscription have now been fulfilled, but why were the faces of Genji, Nanjo, and Chiyo destroyed? Maybe someone really is trying to hide their identity as Battler speculated. And now everyone might end up dead as well with something horrible happening to their feet. Chess is no longer the metaphorical game of choice, and roulette can be a metaphor as well. The fact that Kanon was killed might indicate that roulette is a bad metaphor, since Kanon used roulette as his analogy of choice. Beatrice was closely involved in Kanon’s death, even if she was not the one to deal the blow. Kanon knew a lot more about the game than he let on. There really is an outsider on the island. Maria is the killer. She drugged her victims and rendered them helpless, which explains how she could have killed so many people at once. Maria was protected by the scorpion amulet she was carrying. Maria usually had her creepy moments, which only got worse when the murders started as she used her obsession with the occult to escape the reality that her mother was murdered. And with people having been killed right before her eyes, she is now having a psychotic break and has ended up only capable of singing and unresponsive to the rest of the world. Maria might be suffering from post-traumatic stress disorder. It seems that my attributing every mental disorder there is to Maria is well under way. Chiyo is the killer. She was the closest to Kanon when he was attacked, and she had opportunity to leave the letter on the table. She may have been motivated by something from her past with the Ushiromiya family, something that might have been hinted at with how she emphasized with Natsuhi in episode I-I. And the way she does not stand out and maintains a cowardly demeanor could help divert suspicion. This theory might actually be worth something if Chiyo had not ended up being a victim. Natsuhi, Battler, George, and Jessica could not have been responsible for the deaths of Genji, Nanjo, and Chiyo as they were all huddled inside Kinzou’s study. 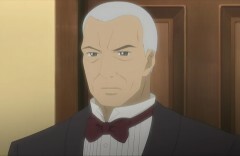 Genji might be in on a conspiracy, since he had talked as if Beatrice had a quite strong influence on events even now in the previous episode, but had revealed she was dead in this episode. He might just be the very superstitious type, though. Genji, Nanjo, and Chiyo might be aware of a cycle where they revive each iteration, which might explain why they didn’t look so worried when leaving the study. George and/or Jessica are going to snap. No, it was definitely Kanon who pulled it out. This was actually shown in the VN. I think you’re onto something here. I don’t know about Nanjo and Chiyo, but I think Genji knows something. He’s just been incredibly calm through the whole ordeal. I suppose that’s part of his job, but I just get a feeling that he knows more than he’s letting on. I’ve hidden what might be too much of a spoiler to those who have no read the visual novel (such as myself).